"There are but two answers to the question of Humanity's survival in the face of a hostile cosmos; overwhelming force and the will to use it." Bolter Drill: +10 to Ballistic Skill and +2 damage with bolt weapons [included]. Rapid Reload: Halve all reload times [included]. Air of Authority: Influence more targets with Command. Mighty Shot: Add +2 damage to all ranged weapons [included]. Hip Shooting: As a Full Action the Astartes may make a Full Move Action and fire a single shot with a ranged weapon. Trained: Awareness, Ciphers (Chapter Runes), Common Lore (Adeptus Astartes, Astral Claws, Imperium, War, Imperial Guard, Imperial Navy), Dodge, Drive (Ground), Forbidden Lore (Warp), Intimidate, Literacy, Navigate (Surface), Scholastic Lore (Codex Astartes), Speak Language (High Gothic, Low Gothic), Stealth, Survival, Tactics (Assault Doctrine, Armoured Tactics, Orbital Drop Procedures). +10: Forbidden Lore (Adeptus Astartes). Master Crafted Astartes Bolter w/ Fire Selector, Mag-Lock and Motion Predictor. +2 Initiative; +10 to hit, +20 when Semi or Full Auto; Basic; 100m; S/2/4; D10+9+2+2; X; Pen 5; Clip ; Reload [1/2]; Tearing. Vengeance Rounds: Penetration 9, Felling 1. Jams on 91-100 and bad things happen. +10 to hit; Pistol; 30m; S/2/-; D10+9+2+2; X; Pen 5; Clip ; Reload [1/2]; Tearing. 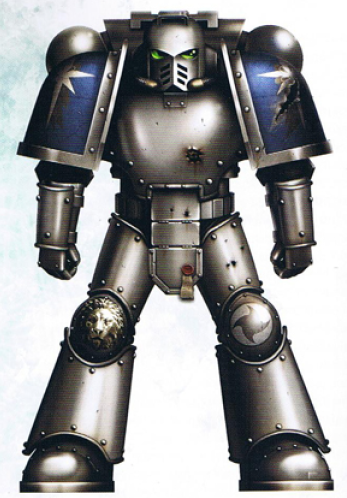 Mark III Power Armour: An ancient suit of power armour drawn from the Astral Claws vaults after Harkon's promotion to Centurion. Death is Joy: Add +2 to critical damage and inflict +1 magnitude to hordes. Became an Astartes just before the Scourge Campaign in 640.M41. Indoctrinated with an utter belief in the glory of the Imperium and the need for extreme action to maintain the Emperor. First fighting as part of assault force during this Campaign. Part of force that accompanied Huron to the Lycanthros Drift in 780.M41 and saw there that the other Space Marine Chapters were not as competent as the Astral Claws. Determined this to be because of Huron's extreme tactics. When the Crusade happened he missed out because he was training the Badab PDF, the units that would later become the Tyrant's Legion guardsmen. When these legions were formed he was given command of a unit as a Centurion. This required him to lead the guardsmen but also to punish them and be a symbol of the Tyrants utter strength. Tyrant's Legion were obliterated by Fire Hawks in an orbital bombardment of toxins and Harkon was reassigned to a Retaliator unit. Having survived the destruction of his entire unit of underlings he is not in a good mood.